"And here is my The Justice League membership card, but that doesn't prove I know Batman." 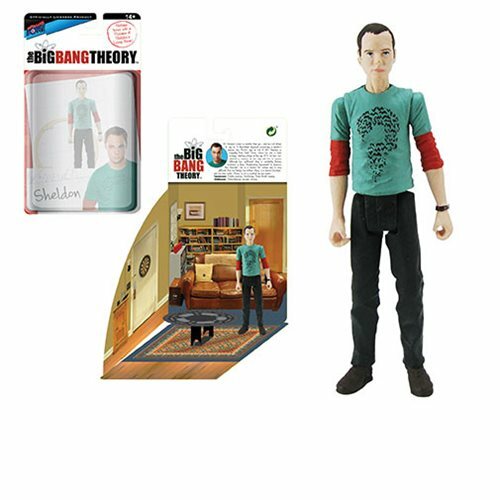 3 3/4-inch scale action figure of Sheldon Cooper from The Big Bang Theory! Sheldon Cooper wearing a green The Riddler T-shirt. This wonderfully meticulous Bif Bang Pow! 3 3/4-inch scale action figure of Sheldon Cooper from The Big Bang Theory details the physicist in an inquisitive green The Riddler T-shirt with black bats forming a question mark. His wardrobe is completed by a red long sleeve undershirt along with black pants and dark brown shoes. The apparel is inspired by Sheldon's outfit from an actual episode! Dr. Sheldon Cooper is smarter than you – and he's not afraid to say so. A theoretical physicist possessing a master's degree, two Ph.D.'s, and an IQ of 187, Sheldon is originally from East Texas, where he was a child prodigy, starting college at the age of 11. He has zero interest in romance, as his only real love is science (although his "girlfriend" Amy is constantly finding loopholes in their "Relationship Agreement" to disprove this theorem). Sneak Peek: Three New Sheldon Action Figures – Convention Exclusives!